This works reasonably well in my company environment. But if I deploy the project the the productive engine (to the cloud) this user lookups can take up to 2 minutes. At least if I search for a not existing user? How can I speed it up? The security system here is configured to use an LDAP. Shouldn't this be a fast protocol? The solution is to use our cached user lookup: SecurityContext.findUserWithoutLookup("theUser") As the users are synchronized once a day into our cache table, this should be sufficient for most use cases. With this setting you speed up the lookup for not existing names as following referalls (browsing attached ADs) could take ages if you come from a different network. How can I specify additional properties/attributes for an External Security System? How to read LDAP/Active Directory/Novell Directory-attributes of a user? How to map AD group to Ivy role? How to read and synchronize users from multiple Active directory domains? How can I troubleshoot problems with the user synchronisation from Active Directory or another LDAP server? 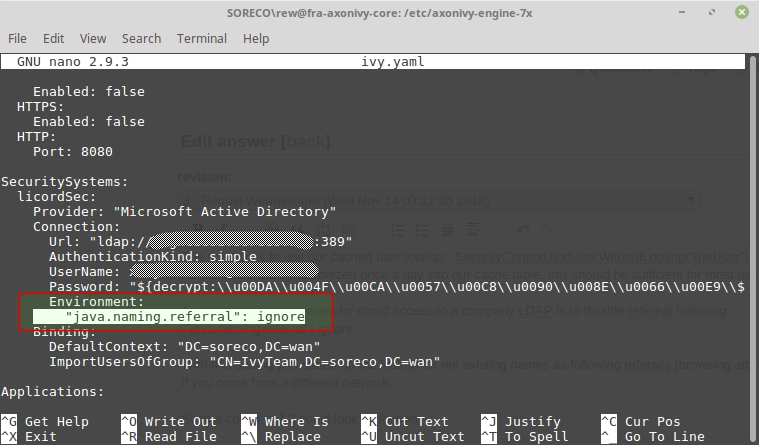 How can I prevent to import deactived users from Microsoft Active Directory ?